This is how the deck looked when I got started. Chipping and peeling stain and weathered wood. When we had the siding and windows replaced in our home, we discovered that the front porch had been made of untreated wood and was beginning to rot. We had it completely re built. 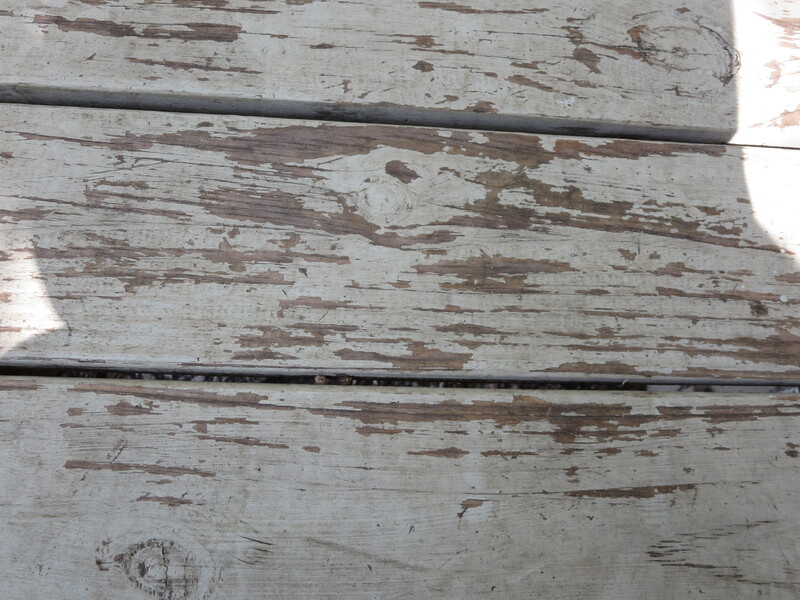 Additionally, the porch at the back of the house, which we added to the house the summer after the back steps collapsed to the advance of termites was also sourly in need to a good refinishing. My duty, therefore, has been to completely refinish both of these outdoor spaces. It was quite a job. We chose for the project to use a product called DeckOver, which is manufactured by Behr Paints. We chose the regular untextured version. All of our external paints are Behr products but were disappointed to discover that the Behr branded colors we used for the siding and trims around the house was not available in the DeckOver product. Fortunately, color matching technology does a decent job and we were able to have a batch specially blended for our needs at the local Home Depot. Here is the wood after giving it a good sanding. The front porch was an easy process. I caulked up some seams and layed down a couple of coats in a single day. No big deal. The back porch, however, was another story. 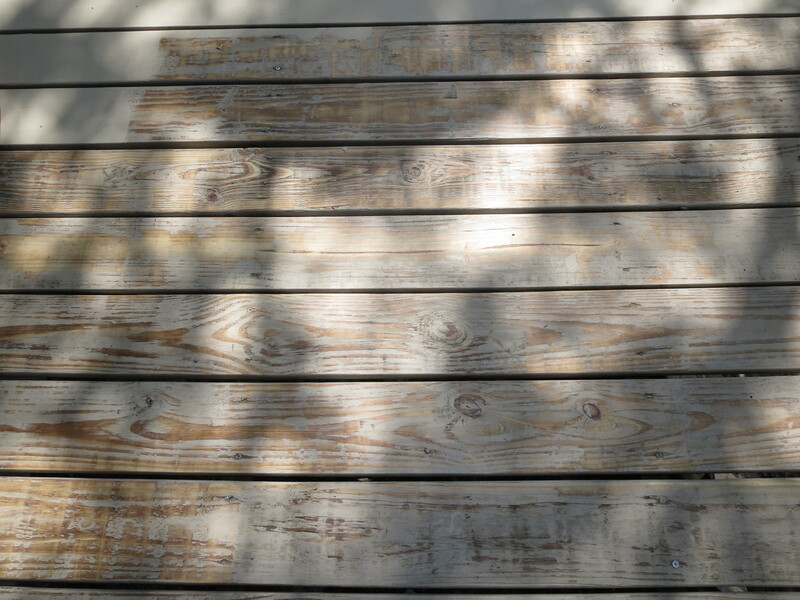 The back porch had been previously stained with an opaque deck stain, also a Behr product. It is on the south side of the house, with some little shade, but mostly exposed to the elements unrelentingly. The stain was stripping away and peeling, and so I had to set to work to sand the entire surface. My goal was not to remove the old stain entirely, but to strip away anywhere that the stain had lost its grip on the wood. 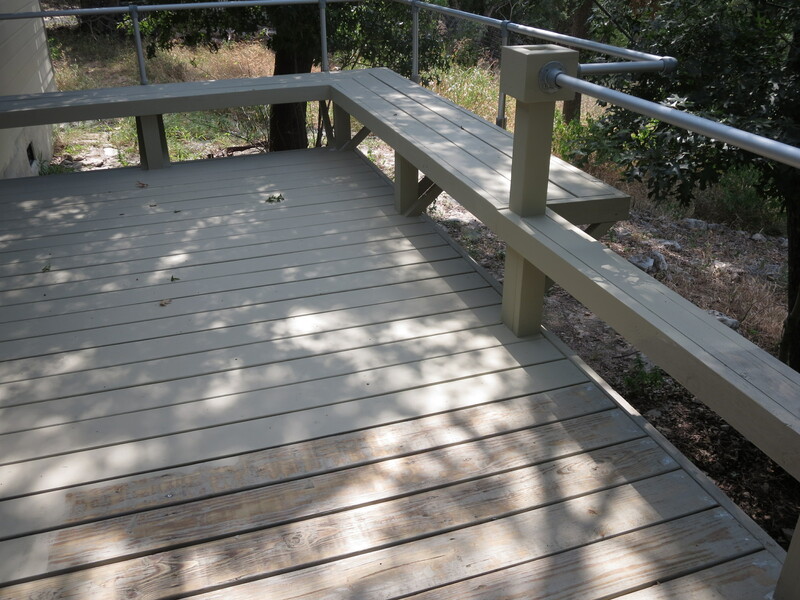 Additionally, the deck had not been perfectly built and I wanted to improve its overall appearance by sealing seems and covering screw holes throughout. I lost count of how many tubes of caulk I used doing that portion of the project. Finally, I also wanted to make sure that the whole porch would last a good long time, so I worked hard to cover the underside of the porch and get the sides of each floor beam covered in all the spaces in between. You can see the vast improvement already with only one coat of the DeckOver on it. I believe the whole project took me something like 100 hours to complete. Obviously, I didn’t do all those hours this week! The result, however, is spectacular. Our deck had been looking old and tired, but now it looks fresh and strong and ready to withstand the elements for many more years. The DeckOver goes on very thickly, and I was working in hotter than recommended conditions. If you can, I definitely recommend working this when it is cooler outside. I didn’t want to wait because around here the cool weather usually comes with wet weather and that would not have worked at all. I almost feel as if the wood of my deck has been petrified by the product into a stone or cement like object, impervious to the weather. I hope that this proves to be true. Its a cold and rainy day today, but I will try to get y’all a great image of the finished deck soon.